Is it worthwhile spending 5 days in Kakadu in April? The Aurora Resort has a 5-day package and before we book we would like to know whether there is much to do during this low season? The most important thing to understand about a Kakadu visit during that time of the year is that the weather is totally unpredictable. It is impossible to say what exactly you will find in April. Wet seasons are unpredictable. Generally sealed roads are passable all year round, unsealed road access is often restricted to the dry season. However, there is no guarantee that the sealed roads will be open. Nobody can predict cyclones that far ahead, and if one of them passes through everything can flood. It happens every year, sometimes more than once, and it could happen exactly while you are there. There is a very small chance that it will be very, very wet during your visit! The road to Gunlom Falls usually floods and may also be closed. The Arnhem and Kakadu Highways and the Nourlangie Road are sealed and generally open. Wet season flooding can cause closures, sometimes for days. The access to Gubara Walk at Nourlangie is often closed or restricted to 4WD only. The Ubirr road tends to flood at Magela Creek. It is often closed or restricted to 4WD only. That's what it could look like, if it's a late wet. On the other hand, if the weather plays along, it is a spectacular time of the year. What were you planning on doing in Kakadu? Five days would be a long visit for someone who mostly drives around. If you like hiking and are a nature buff, then you may find it easy to keep yourself entertained for five days. Were you planning on spending the five days all in the same place? At Aurora? That would involve hundreds of kilometres of driving back and forth the same roads. I would think spending a couple of nights at Cooinda would make more sense. 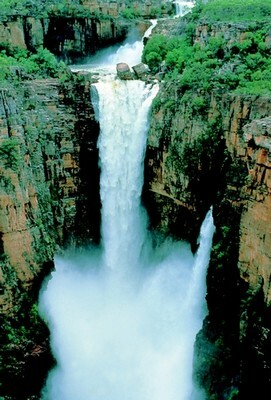 Check out the suggested wet season itineraries for Kakadu on the government website. I also need to warn you that coming from Melbourne you may find it rather warm and sticky!